The media’s … progressive politicians’… and Department of Justice (DOJ) “Deep State” bureaucrats’ heads are spinning. For the first time, the Department of Justice has declared it will protect and defend religious liberty – not be at war with people of faith. What just happened at the recent Alliance Defending Freedom (ADF) Summit on Religious Liberty is historic … not only for Christians … but for people of all religious faiths. Attorney General Jeff Sessions announced the formation of a Department of Justice (DOJ) Religious Liberty Task Force. As President Trump promised, he is dead serious about making the preservation of religious liberty in America – and around the world – a priority again. In the first 18 months of the Trump administration, the DOJ has brought 11 indictments and received 7 convictions for hate crimes involving attacks or threats of attacks against places of worship – the majority of which have been non-Christian houses of worship. Haven’t heard about these cases in the mainstream media? The Daily Beast accused Jeff Sessions and the task force of “declaring war against LGBT people.” The headline of their article implied that LGBT people are a religious group … and that the Religious Liberty Task Force plans to deny the group their religious freedoms. The Washington Post ran an article with a headline and content that clearly implied that the purpose of the task force is only to appease conservative Christians. In fact, the panel of speakers that shared their personal religious liberty battles following Sessions’ speech included a Chabad Jewish rabbi and a Sikh lawyer in addition to Christian baker Jack Phillips. I am quite curious about what the symbol below the header “United We Stand” is. 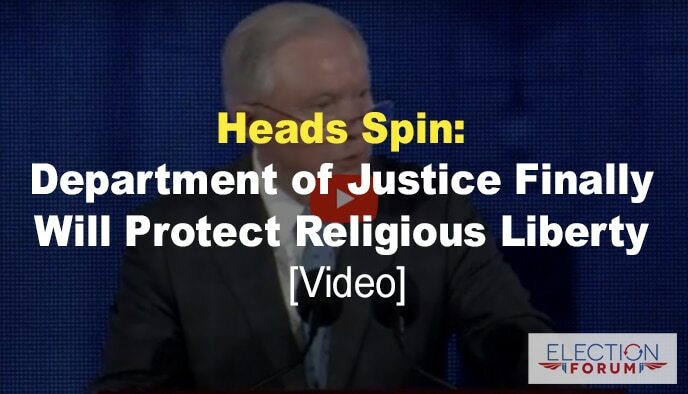 The item in question is immediately to the right of the picture of Sessions speaking at the Alliance Defending Religious Freedom on the Election Formu page of 15 August 2018. 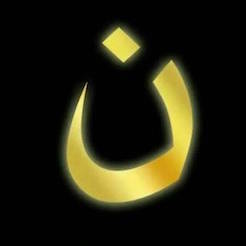 The symbol is an arabic letter ‘nun’ (N) signifying ‘Nazarene’ and which ISIS posts on the doors and houses of Christians, marking them for persecution.